No, the title isn’t a trick. You can really get incoming links from Facebook — for free! And these are links which are picked up and indexed by the search engines. Not too shabby, huh? 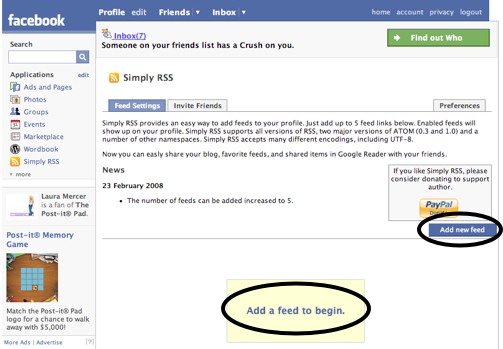 Create a new page under a suitable category and add your RSS feed to it using an application, such as Simply RSS (as shown below). It’s important to fill out the options correctly when creating your page, such as proper keywords, descriptions and a unique title. The links displayed on the page are crawlable by search engines, and links indexed. But it’s important that you do it carefully and not create a page just for the sake of getting some backlinks. Make sure your page has content and actually serves a purpose to other visitors on Facebook.